While we continue to learn more and more about the troublesome consequences of not getting enough sleep, when it comes to shuteye, it isn't all bad news. In fact, a recent survey from the National Sleep Foundation found that 76 percent of people say that they have a good night's sleep at least a few times each week and 42 percent every night or almost every night. "This poll shows that Americans are taking control of their bedrooms and they are happy with the results," David M. Cloud, CEO of the National Sleep Foundation, said in a statement. The survey asked more than 1,000 people about their bedrooms and how they felt their bedrooms affect their sleep. 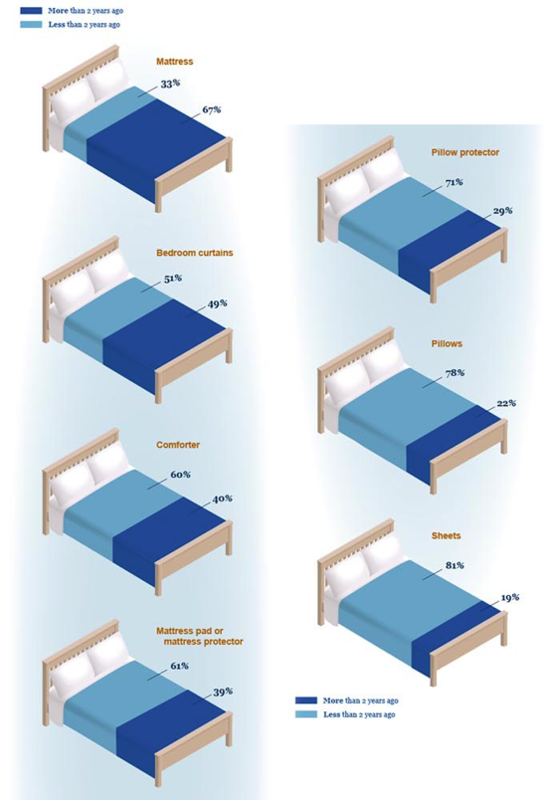 Respondents rated a comfortable mattress, pillows and sheets among the most important bedroom items to getting a good night's sleep, followed by a quiet and dark sanctuary of a bedroom. Because people believe their mattress, pillows and sheets are so important to getting the best rest, the National Sleep Foundation decided to dig a little deeper and asked about when people had last purchased their bedroom items. While it can be a bit of a guessing game to tell when it's time for a new mattress or pillow, there are some general rules of thumb. Mattresses usually last between five and 10 years, depending on the quality of the mattress and your age, according to Consumer Reports. Rotating the mattress periodically can help extend its lifespan. A visibly saggy or lumpy mattress is probably overdue for a replacement, according to The Better Sleep Council, and waking up with new aches and pains could be a sign it's time to look into a new set up as well. The thinking is a little bit fuzzier on pillows. The biggest drawback to keeping them around forever is the amount of dust mites that may make your pillows their home. In some people, these lurkers can cause allergic reactions, triggering asthma-like symptoms or sinus problems, according to The New York Times. As long as you're washing them regularly, sheets shouldn't pose much of a mite problem though. Because 86 percent of people surveyed said comfortable sheets are important for getting a good night's sleep, they're worth replacing when they start to look and feel old. But just how old is old? In the infographic below, courtesy of the National Sleep Foundation, you can see just how long ago people bought their bedding. The light blue illustrates fewer than two years ago, while the dark blue is more than two years ago. How do you compare?